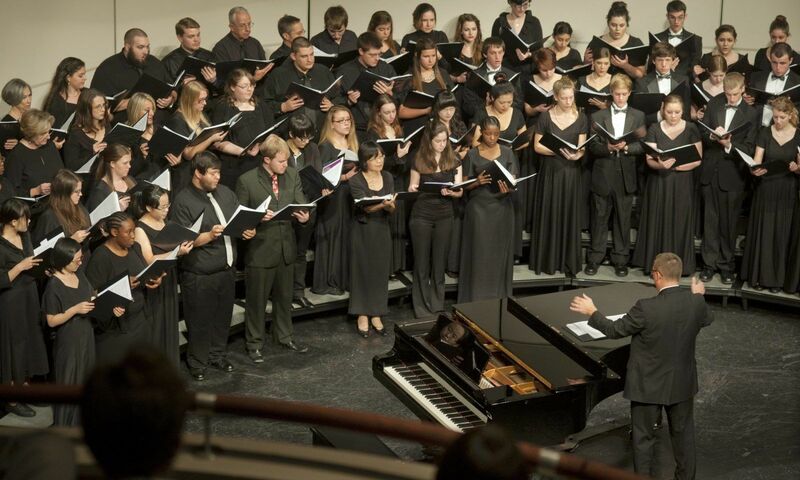 Bobby Ivey, assistant professor in the music department, leads the Brenau University Spectrum Singers, Vocal Chamber Ensemble and the Chestatee High School I Cantori in their first song of A Holiday Concert Friday, Nov. 26. On Monday, April 10, Spectrum Singers and Vocal Chamber Ensemble, under the direction of Bobby Ivey, will delight the audience with a variety of songs from around the world in the Department of Music’s final concert of the semester, “Get Your Passport Ready!” This is the last program of the Concerts Connecting Cultures series. Five of Brenau’s international students from China are participating in Spectrum Singers this semester and Lisa Wang will accompany the group playing a Chinese folk song on the erhu. The concert will start at 7:30 p.m. in Pearce Auditorium, and is free and open to the public. For more information call 770-538-4764 or go to brenau.edu/fineartshumanities/music/.